At least 70+ people have died in Greece's wildfire, the worst they've had in over a decade. 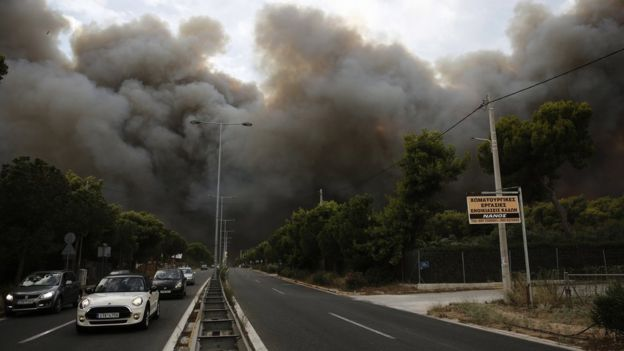 A wildfire has emerged in Greece, Athens. The flames have swept across the Athens region, reaching a length of a destructive 25 miles. It had been started on Monday and some places are still burning on Tuesday. Many charred bodies have been found near the sea due to the flames pushing people back there, only to be blocked by walls of smoke and fire. Many others were found dead in buildings and cars. ﻿Smoke & Fire over the suburbs of Athens. 26 bodies were found, both adults and children, who had apparently been hugging as they died, just meters away from the ocean, trapped by the fire and smoke. One of the heads for Red Cross, Niko Economopoulos stated that "They had tried to find an escape route but unfortunately these people and their kids didn't make it in time. Instinctively, seeing the end nearing, they embraced." At least 150 people have been injured. The Prime Minister has declared a state of emergency, he has said that all emergency services have been mobilized. The country has also asked for other countries for additional helicopters and firefighters to help out during their bad times. It's unsure what has initially started the fires. They are common during the warm summers, especially in Greece. It has been suggested by AFP that the fires could've been arsonists looking to loot abandoned homes. Fifteen fires were started simultaneously on three different areas in Athens. UpBeat sends is hopeful wishes to Greece and the people who have been affected by the devastating wildfire.